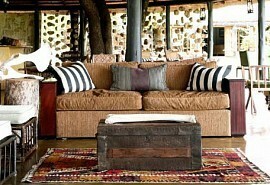 Rhino Post Lodge offers 8 elegant safari suites in an exclusive property within the Kruger Concession area. Special care was taken when building the lodge to minimise the impact on the environment and it offers a huge diversity of fauna and flora. Set on the banks of the Mutlumuvi Riverbed on the Southern end of the concession in the Kruger National Park, famous for the Big Five, you will find Rhino Post Safari Lodge. 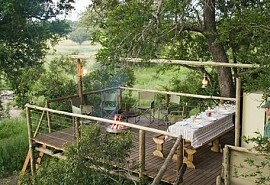 It offers exclusive traversing in 12 000 hectares of pristine bushveld. The concession offers a huge diversity of fauna and flora; an ideal setting for an incredible wildlife experience. Game drive safaris at Rhino Post Safari Lodge are conducted in specially adapted open Land cruisers, with professional guides. Guides at the lodge meet the strict requirements of the South African National Parks. Guests can expect to see lion, leopard, elephant, buffalo and rhino as well as a variety of general game and other smaller creatures. The birdlife here is prolific. 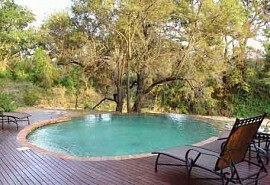 Upon returning to the lodge guests enjoy a leisurely brunch and time to relax around the pool overlooking the waterhole. In the late afternoon after high tea, guests can enjoy an evening game drive, watching an African sunset and spotting nocturnal animals in the park. Plains Tented Camp is a small and intimate bush camp offering only 4 traditional canvas safari tents situated underneath the trees promising spectacular bush views and comfortable en-suite facilities. Pafuri Camp offers a wild and traditional safari experience in a private corner of the Kruger National Park and offers varied vegetation, incredible game viewing and some of the best birding the Kruger has to offer. 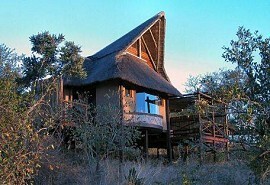 Lukimbi Safari Lodge is a magnificent safari lodge situated in the sought-after Kruger National Park. 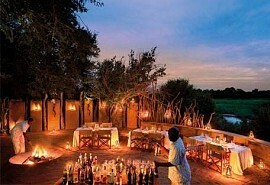 The park is renowned for its incredible game viewing opportunities as well as big five game viewing. Tinga Legends Lodge offers the ultimate in five star bush luxury with luxurious and spacious safari suites offering air-conditioning, double showers and modern amenities. 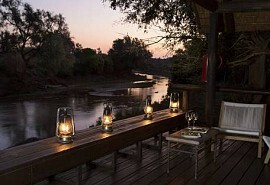 The Sabie River is known to offer the highest recorded concentration of leopards in Africa. Jock Safari Lodge is luxurious and unique; situated amongst lush trees and reed walls, guests can enjoy a luxurious safari experience in complete privacy in an untouched wilderness. 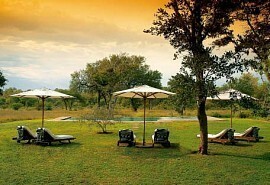 Luxurious safari suites with en-suite facilities and private views. Hoyo Hoyo Tsonga Lodge is an authentic safari lodge offering guests luxury and charm in the heart of the Kruger National Park. Accommodation is luxurious and only 6 traditional Tsonga Huts are available ensuring a personal safari experience.